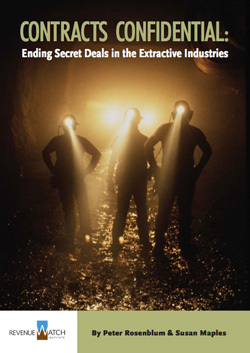 Revenue Watch is pleased to announce the release of a new report, Contracts Confidential: Ending Secret Deals in the Extractive Industries, that aims to promote a serious conversation among industry, governments, investors, banks and civil society organizations about disclosure and confidentiality in extractive industry contracts. It is hard to talk about secrets. Neither governments nor investors like to give much detail when asked to describe the confidential information in oil, gas and mineral contracts, or their reasons for secrecy. Yet contract transparency is sorely needed to improve the management of natural resource wealth, in particular in developing nations where such resources often account for more than half of the national income. When contracts are publicly available, government officials have an incentive to stop negotiating bad deals and citizens can better understand the complex nature of their country's agreements with industry. This report, based on legal research and extensive interviews, delves into government and private sector objections to contract disclosure and makes conclusions about what information may legitimately and reasonably be kept confidential, and how civil society institutions can better confront the challenge of secret deals. Contracts Confidential was launched on September 23 at an international conference in Washington, D.C., organized by seven international organizations concerned with reform of the oil, gas, and mining industries: Revenue Watch Institute, Oxfam America, Oxfam Novib–Netherlands, International Institute for Environment and Development, Global Witness, Bank Information Center, and Publish What You Pay–US. The one-day conference discussed the political and legal context of extractive industry contracts; licensing and negotiation; confidentiality and transparency of contracts; citizen and parliamentary participation in negotiation; approval and monitoring of contracts; the financial "take" of the government contracts; and contract negotiation and renegotiation experiences. Specific experiences in Liberia, Ghana, Peru and Azerbaijan were examined, and participants priorities for a reform agenda. 24 min 20 sec ago.